Goodwin (forearm) was placed on injured reserve Friday, Brandon George of The Dallas Morning News reports. Analysis: Goodwin suffered a fractured forearm during Dallas' loss to Washington in Week 7 and will miss the remainder of the 2018 season. The depth cornerback's absence is unlikely to noticeably affect the Cowboys' secondary, but it could make for an increased in available special teams snaps. Goodwin fractured his forearm in Sunday's loss to the Redskins and is set to undergo surgery Tuesday, Brandon George of The Dallas Morning News reports. Analysis: Goodwin was picked up by the Cowboys prior to Week 6, but failed to take the field. He accumulated one solo tackle in Sunday's outing before injuring his forearm. It is now just a matter of time before the team places him on injured reserve. As a depth corner who was seeing his first playing time of the season, his absence is not likely to impact anyone else's playing time. Goodwin is questionable to return to Sunday's game against the Redskins due to a forearm injury, Kareem Copeland of The Washington Post reports. 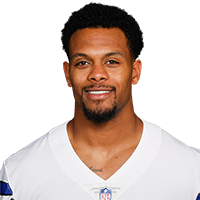 Analysis: Goodwin, who signed with the Cowboys less than two weeks ago, exited Sunday's game during the fourth quarter. Expect an update on the depth cornerback's health after the Week 7 contest if he's unable to retake the field. Goodwin was signed from the Bengals' practice squad by the Cowboys on Tuesday, Adam Schefter of ESPN reports. Analysis: The 28-year-old cornerback is now with his third team this season after stints with the 49ers and Bengals. In 2017, he suited up for both the Falcons and Cardinals and logged eight tackles (one solo) over 14 games. Goodwin will look to provide depth in the Cowboys' secondary. Goodwin and the Bengals agreed to a contract Saturday, Adam Schefter of ESPN reports. Analysis: Goodwin was just released by the 49ers at the start of training camp. He played last year for both the Falcons and Cardinals and logged eight tackles (one solo) across 14 games. He will now need to impress the Bengals coaching staff during the exhibition season in order to have a chance at landing on the team's final roster. Goodwin was released by the 49ers on Tuesday, David Lombardi of The Athletic reports. 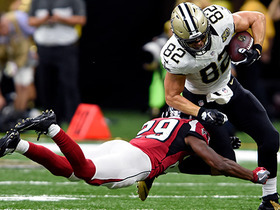 Analysis: Goodwin, who spent parts of last season with the Cardinals and Falcons, will look to catch on with another squad during training camp. The 6-foot-4 cornerback has just two career passes defensed with two years of experience in the league. Goodwin was claimed off waivers by the 49ers on Tuesday, Nick Wagoner of ESPN.com reports. Analysis: Just a day after being waived by the Giants, Goodwin has a new home in the Bay Area. He will attempt to latch onto the 53-man roster as a reserve corner and special teams contributor. Goodwin was waived by the Giants on Monday, Ian Rapoport of NFL Network reports. Analysis: Goodwin was claimed by the Giants less than two weeks ago but it appears he failed to impress enough to stick around long. If he goes unclaimed he'll be a free agent and can sign with any team. The Giants claimed Goodwin off waivers Wednesday, Michael Eisen of the team's official site reports. Analysis: Goodwin, who was waived by the Cardinals on Tuesday, is the sixth defensive back the Giants have added this offseason. Standing 6-foot-4 and weighing 220 pounds, he brings outstanding size to the secondary and will get to reunite with defensive coordinator James Bettcher, who coached Goodwin in Arizona during the 2016 and 2017 seasons. Goodwin was released by the Cardinals on Tuesday, Darren Urban of the team's official site reports. Analysis: The 28-year-old cornerback logged 12 games for Atlanta and two games for Arizona in 2017, notching nine total tackles in mainly special teams roles. Goodwin will look for a depth role with a new roster.